I am a deadline person. [tap, tap on my own shoulder] Just in time for the last Tuesday update I finished the Lopi socks. A picture is worth a thousand words... Really? This is so not true!!! Since the first picture looks really scary I decided to have the socks modeled. However... Dear Sockpal! Forget about silly platitudes. I can assure you that in contrast to what you see here, your socks have the shape of real socks. And even better: they fit your given measurements. The following will not be thousand words but a few to explain this sock situation. The fair isle knitting in the toe area enhances exactly the danger zone that kind of mysteriously vanishes after a while if I wear socks. If I am very lucky, my sockpal works walks the same way. Plus, it works like a antishock pad, at least for the first couple of times wearing them. To balance the solid toe I went for a slip stitch heel. In result you'll find a cushion there as well. These socks certainly enable the wearer to master a walk in delicate hiking boots as well as to protect sensitive walking gear on a pitch-dark baresock-footed obstacle walk through LEGO blocks. At least I do hope so. 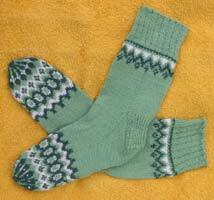 b) knit another pair in traditional shaping. by Carola at 7:17 e.h.
ágúst 30, 2005 12:45 f.h. I think these might be my favorite Sockapal2za socks - you've inspired me to try something like this with my own Lopi pattern books! ágúst 30, 2005 1:17 f.h. OOOO I wish I was your sock pal. They are BEAUTIFUL! ágúst 30, 2005 2:19 f.h. The socks are beautiful. Can I be your secret sock pal? P.S. I meant to say that the anklets are very cute and I love the striping of the yarn. ágúst 30, 2005 3:36 f.h. Wow, those socks are amazing. Your sock pal is really lucky! ágúst 30, 2005 6:21 f.h. They are GORGEOUS! 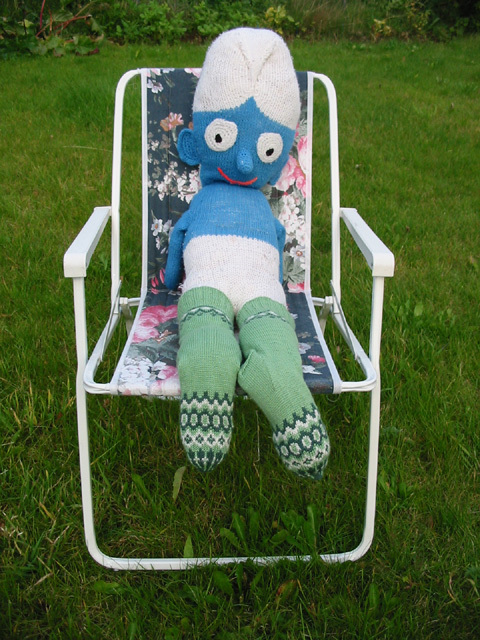 I was tempted to do a 2 color sock for my sock pal but I was nervous it wouldn't come out right. Yours are beautiful though. Did you follow a pattern or is this your own? ágúst 30, 2005 9:59 f.h. they are absolutely amazing! i wish i had the patience to tackle something like that. just gorgeous. ágúst 30, 2005 10:22 f.h. Gorgeous! I bet everyone is hoping that they are your Sock Pal! ágúst 30, 2005 12:13 e.h.
Those are really gorgeous ... great job! ágúst 30, 2005 1:40 e.h.
ágúst 30, 2005 3:37 e.h.
ágúst 30, 2005 4:34 e.h. Thank you for stopping by. These are wonderful socks, your pal is really lucky! ágúst 30, 2005 9:38 e.h. Please share the pattern, I think we're all waiting with bated breath. ágúst 31, 2005 2:08 f.h. september 01, 2005 2:16 f.h. They are stunning! I think we all hope we're your pal. september 01, 2005 12:18 e.h.
september 06, 2005 12:09 e.h.
What great socks. Great idea to do colorwork to reinforce the toes. And they're oh-so-very Icelandic looking! september 08, 2005 1:39 e.h.
september 13, 2009 5:28 f.h.